After the other day’s Grinchy post about all the worst things you can do when decorating for Christmas, I felt like I had to prove that there were things that I love about Christmas decorations too. As I said before, I absolutely love decorating for Christmas and I have a huge appreciation for those who do it really well. Every year, my family drives around on Christmas Eve to see the lights in our area and we leave notes for the houses with the best lights. There are some surefire ways to get one of the coveted notes, so I present to you: The Commandments of Christmas Decorating. When I was a kid, I begged my parents to put up colored lights. I thought they were way more fun than those boring old white ones. 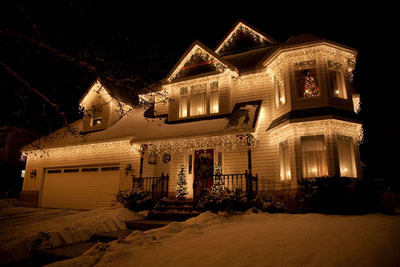 These days I actually prefer the classic, warm, white lights, but I still love when a house utilizes the colored lights. The catch is, which ever color scheme you go with, you MUST stick with it. No mixing white lights and colored lights! Classic white lights are my favorite these days. I love the warm, inviting look they give to a house. As with colored lights, it’s one or the other; if you go white lights, you go all the way. My mom has been putting candles in the windows of our house for as long as I can remember. It’s a homey touch that I really like. In the very top most window of our house we even have a Santa holding a candle to complete the Christmas look. Note, if you’re doing candles in the windows, you must do EVERY window. No slacking! 4. Old fashioned, large light bulbs. Every year there’s a house on our Christmas Eve tour that has a bush decked out in the old-fashioned, large bulbs. It’s a favorite of my mom’s and I have to say I like the old-time look as well. They make for a great way to accent a tree in the yard! I know, I know, this borders on the “excessive” line from my previous post. But, there’s a house in my town that, last year, wrapped a tree in their yard completely in Christmas lights. It looks so cool to see all the branches, even the smallest ones, lit up. If you take the time to do this, let that be the focal point of your decorations; don’t over do it on the rest of the house! I also love wreaths wrapped in lights too. The bigger the better! Again, it’s a great focal piece for your decorations. 6. Garland, or as my mom would say, swag. I had always called this stuff garland until one year, when my mom announced it was time to get out the swag. Apparently she’s not the only one that calls it this because when I Googled “Christmas swag” most of the results were like this; there was only one thuggish looking Santa Claus, so she wins. I love the look of swag around a front door. The best part about it is that it looks great during the day too. 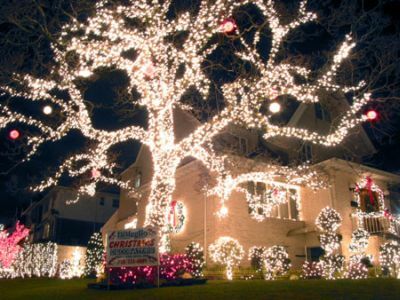 Too many people think only of their decorations in the evening and are left with a bare looking house and lots of wires during the day. Swag is the perfect way to make sure your holiday decorations stand the test of sunlight. My mom uses swag inside too: she wraps it around the banister and hangs it from the mantle above the fireplace. Be creative with your swag! Michael’s and Joanne’s sells pre-decorated swag, but you can buy some that’s relatively plain and dress it up with poinsettias, pine cones, ribbon and lights to match your other decorations. Icicle lights are my personal favorite. Added to any roof line, they instantly make a home look like a gingerbread house. Also, icicle lights are the only type of lights that can be professionally installed and still look good. If your house has a particularly lovely roof line, or if you have a gazebo, icicle lights are definitely the way to go! BONUS – Musically coordinated lights. There is a house I visit every year that breaks every rule of my cardinal sins of Christmas decorating, but is definitely the best decorated house in town. The owner coordinates light shows all night to songs on the radio that you can tune into while you’re parked in front of his house. It’s excessive, ridiculous, over the top, and absolutely wonderful. It goes to show that even the cardinal sins can be committed, and the result can be fantastic. It’s supposed to be pretty mild out today so our family will be getting up all our Christmas decorations! Happy decorating!! 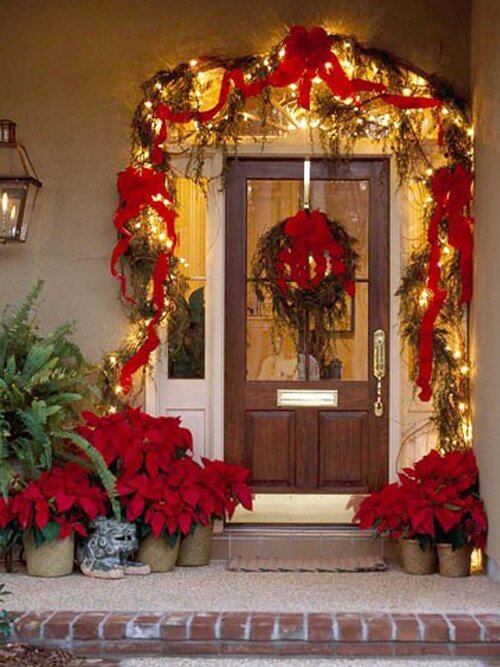 This entry was posted in Special Events, Thoughts and tagged best lighs, christmas lights, colored lights, commandments, decorating, decorations, garland, icicle lights, old fashioned light bulbs, swag, white lights, wreath. Bookmark the permalink. It’s not swag — it’s A swag. The length of garland we have on the mantle (for ex) is also called a swag. I like the front door you show here, maybe we can try something like that?